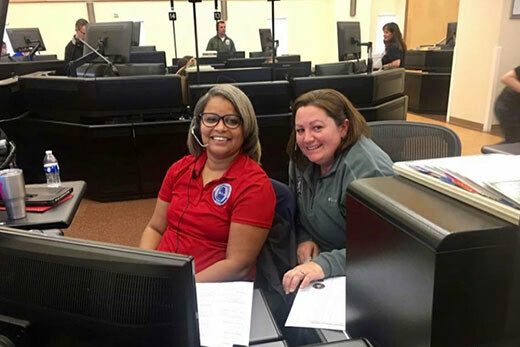 Emory Police Communications Manager Tamika Kendrick (left) poses with a colleague at the Collier County Emergency Dispatch Center in Naples, Florida, where she volunteered to answer 911 calls in the wake of Hurricane Irma. Courtesy photo. As many southwest Florida residents fled the devastation of Hurricane Irma earlier this fall, Emory Police Communications Manager Tamika Kendrick was headed the other direction — among a team of emergency dispatchers who traveled south to help in the aftermath of the mega-storm. The Georgia dispatchers volunteered their time to handle 911 calls and provide relief to beleaguered emergency dispatchers at the Collier County Emergency Dispatch Center in Naples, Florida, who had already worked long hours routing public safety assistance to area residents. The team of 13 volunteer dispatchers worked 12-hour shifts and slept on air mattresses at the center for a week in order to help the department handle five times the normal volume of emergency calls. Emory Report sat down with Kendrick recently to talk about her experience in Florida and what motivates her work on campus. Were you always drawn to public safety work? Not exactly. I’m originally from upstate New York — a one stoplight town where our chief of police was the only full-time police officer. For a while, I did serve as a volunteer firefighter. But in time, I began working for a place that helped adults with developmental disabilities. After my mother and grandmother died, I came to Georgia to continue that work. My aunt lives in College Park, so I would spend summers with her. One day, I saw an ad that said they were hiring dispatchers for the Henry County E911 Communications Center. I wasn’t really looking for another job, but I thought it would be interesting. As it turns out, they hired me. I worked there from December 1995 to July 2012. What appealed to you about being a dispatcher? So much of it is about customer service. Here, one person takes the calls, all the information, and another dispatcher sends the police officer or our Emory EMS unit. We’re talking with people all day long. No two phone calls are ever the same. You have to be quick and be able to adapt. I really love doing what I do, because I love being able to help people. That’s what we do — provide the first link in a chain of getting people help, be it a medical call, fire or police call, we’re the first calming voice on the phone. What kind of calls do you receive at Emory? In Henry County, the call volume was around 1,700 calls a day. Here, it’s probably closer to 60 a day. At Emory, we have all kinds of calls, including public safety and medical calls, where a student is injured or a faculty member has fallen. It really is like serving a small town. How were you asked to report to Florida to help after Hurricane Irma? I’m the president of the Georgia chapter of the National Emergency Numbers Association and am also the regional team leader for the Telecommunicator Emergency Response Taskforce (TERT). About eight years ago, I did a training through TERT that offers help to communities affected by a high-call-volume disaster. It’s a way for other 911 dispatchers to come in and give them some relief. For a federally declared disaster, a state has to send a dispatch request to FEMA. I got a call from our state coordinator on a Saturday evening (Sept. 18) that said they were talking about deploying our Georgia team the next day. On Sunday, I was among six dispatchers from Georgia who left for Florida. What was the situation like when you arrived in Naples? There was a mobile home community probably a mile away from the center that had been demolished, just mounds of metal from homes that been destroyed. Some of the local dispatchers working there hadn’t been home in 10 days, and some even had their kids with them. When we got there, they had been working 12-hours shifts straight. Once we arrived, they were given a day off and then were allowed to work eight-hour shifts. Since the women’s bunk room was already full, we were housed in a training room just off the dispatch center. We slept on air mattresses in between desks, which worked out great. What was the daily workload like? At one point, they were taking 5,000 calls a day, which was five times the normal call volume. You had people from out of town looking for their relatives, alarms going off, domestic disputes, you name it. If called to help, would you go to a disaster again? Absolutely, no doubt in my mind. It really felt good to help the emergency dispatchers — and the community — get back on their feet. And it was very humbling. One of the dispatchers went home only to find that it had been destroyed. So she packed up her belongings and came back to work. It makes you look at things differently. I came away knowing that we all have problems, but it could always be worse. You just have to put a smile on your face and tackle the challenges … and avoid the panthers! I like to eat; I love trying different types of food. I also love sports of all kinds. I have a nine-year-old granddaughter who does competition cheer. She has been cheering for five years and I’m happy to say I’ve only missed one competition. That brings me joy.